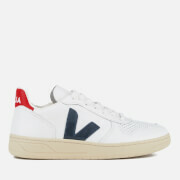 Veja white low top trainers with a vegan design. The men’s ‘Campo’ sneakers are made with laminated cotton uppers and designed with a signature ‘V’ applique to the sides, contrasting navy detail to the heel and a metallic logo to the outer side. The sleek trainers sit on a grey wild rubber sole which is sourced from the Amazon rainforest. 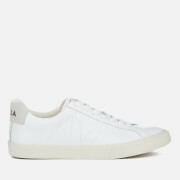 Logo detail to the tongue, foxing to the front of the sole and a textured outsole complete the classic low top design.